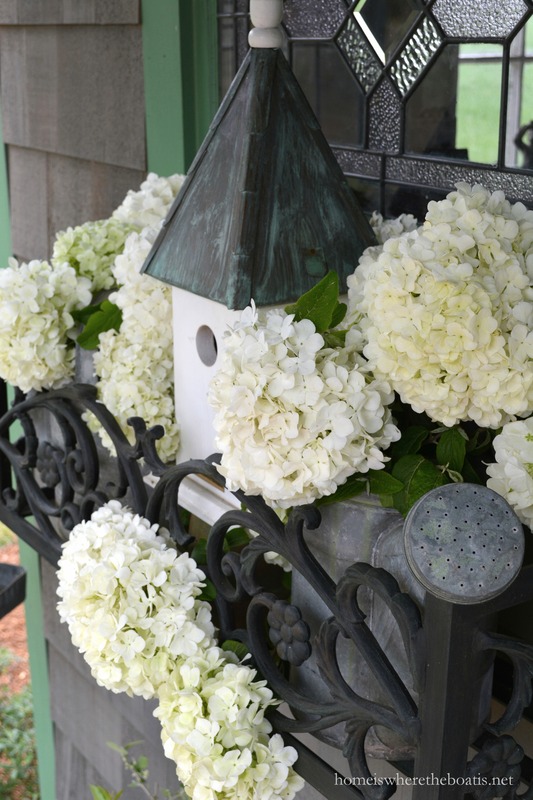 Snowballs in April are a good thing if you’re talking flowers! Our Chinese Snowball Viburnum is blooming, covered in fluffy white flowers. We planted our shrub about 3 years ago but this is the first year it’s been covered in welcome snowballs. 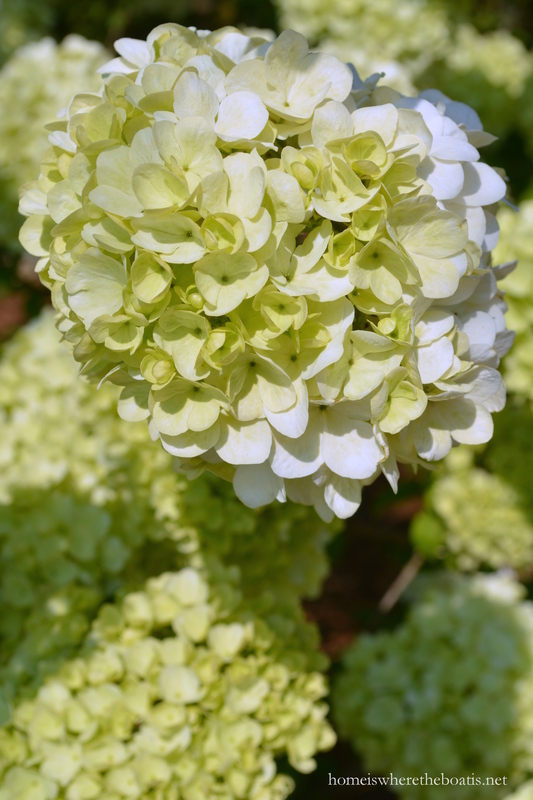 The hydrangea-like blooms start out as green, changing over to cream and then white. 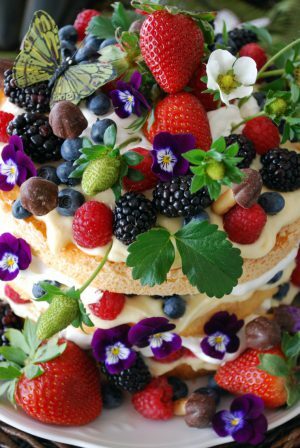 It’s also ideal to enjoy as a cut flower. I’ve been biding my time, waiting not so patiently to plant annuals and pots until after our frost date. 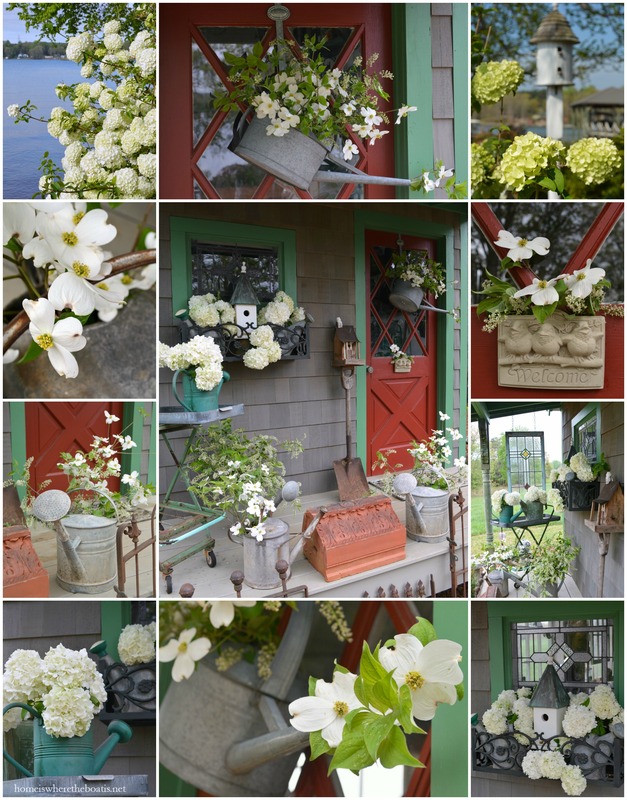 I cut some snowball blooms to fill watering cans and enjoy the blooms around my Potting Shed. Enjoying the snowball effect of the large white flower heads. 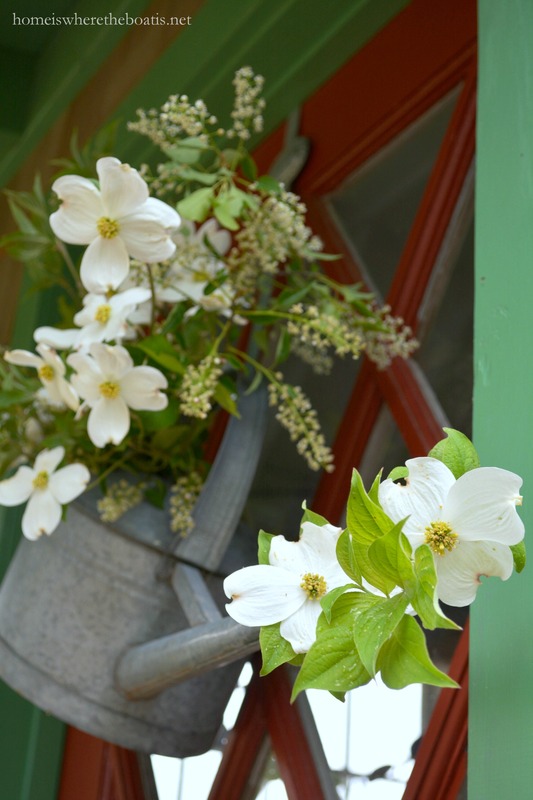 And added some additional white blooms of dogwood and flowering privet to sprinkle in watering cans. 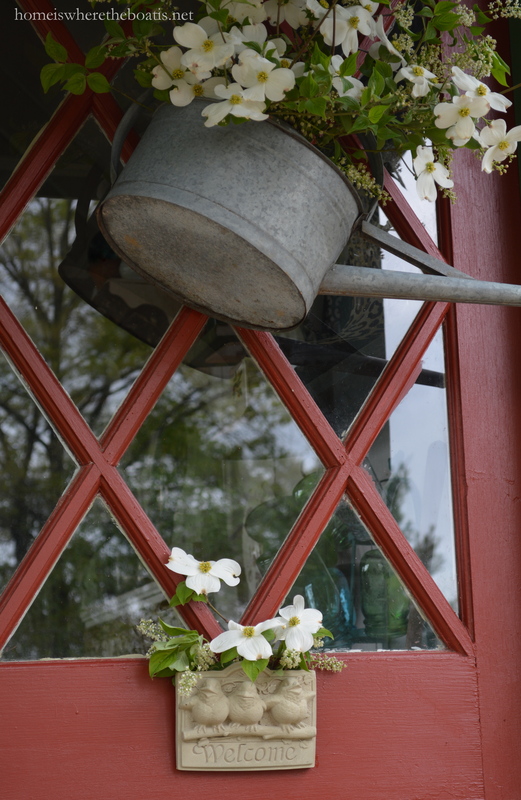 I hung a watering can on the door in greeting. 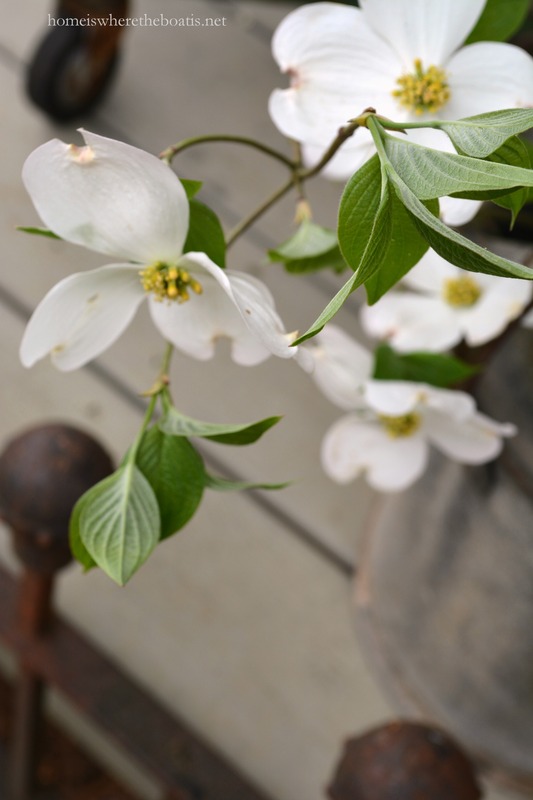 And added some dogwood blooms to stand in for the missing watering can rose. 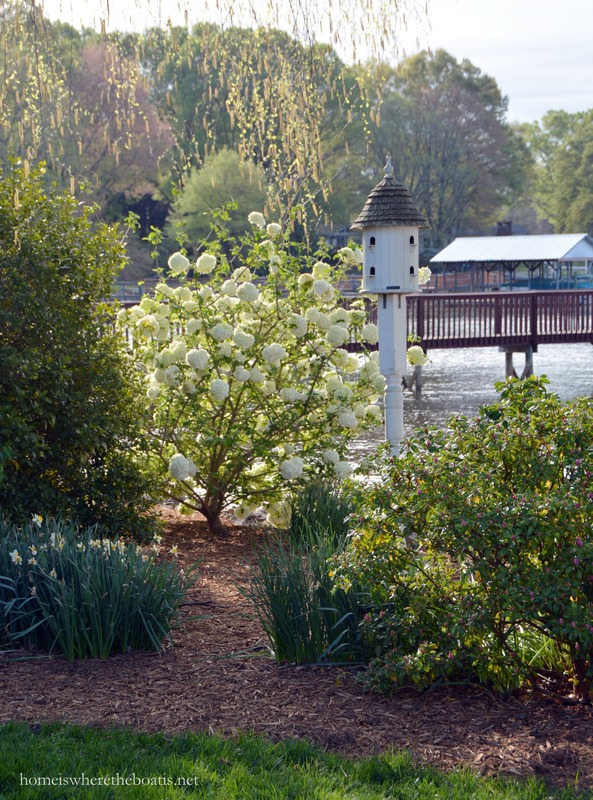 Chinese Snowball is hardy in zones 6 – 9, low maintenance, fast growing, and ideal for enjoying a spring snowball effect! 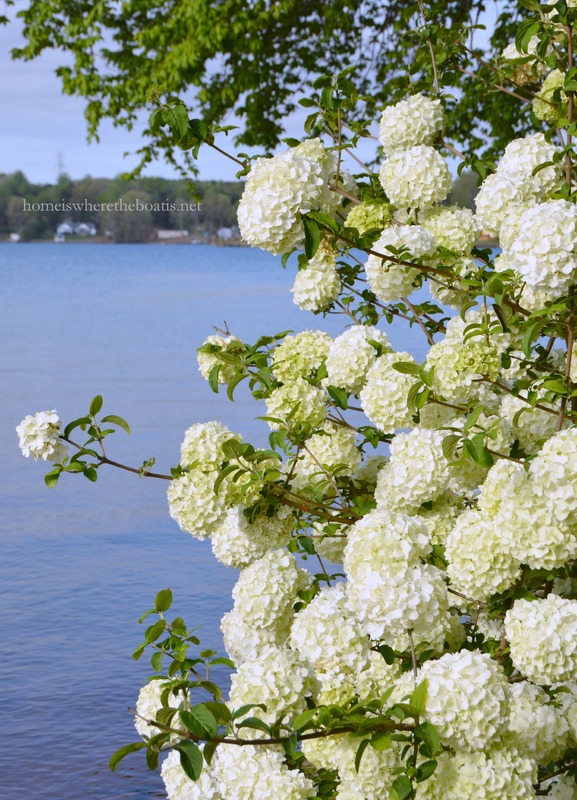 You can read more about Chinese Snowball Viburnum, here. Hope you’re enjoying spring blooms where you are! Gorgeous! From just the title I was trying to figure out where this April post might lead, I pictured those Hostess Sno-ball Cakes… Imagine that, my mind went right to food:@) I’ll bet they smell amazing too Mary-enjoy! 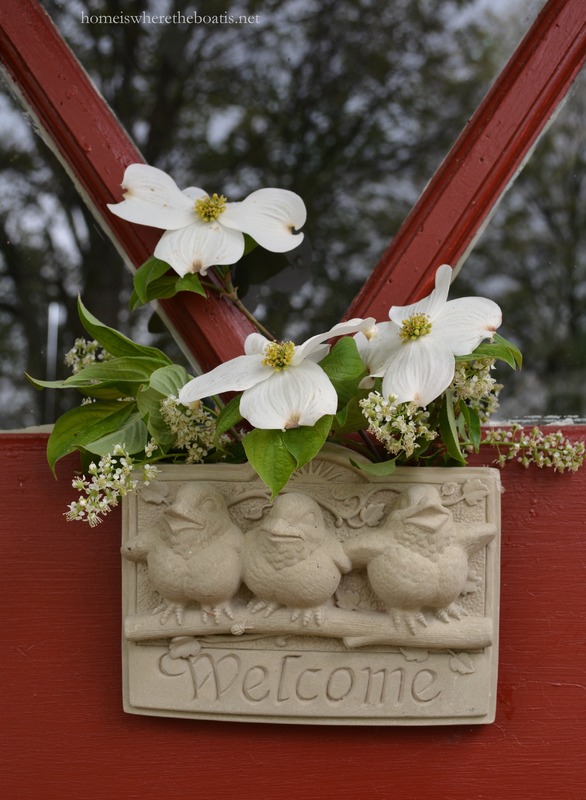 PS-Lovin’ your cute little welcome planter too! Oh Mary, we just had more snow fall. 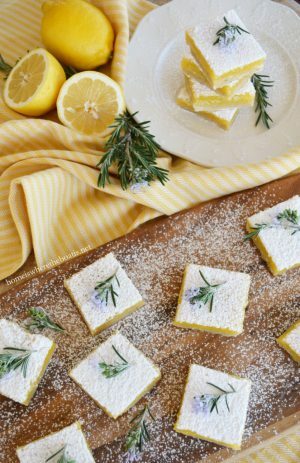 Like your take on Snowballs so much better! 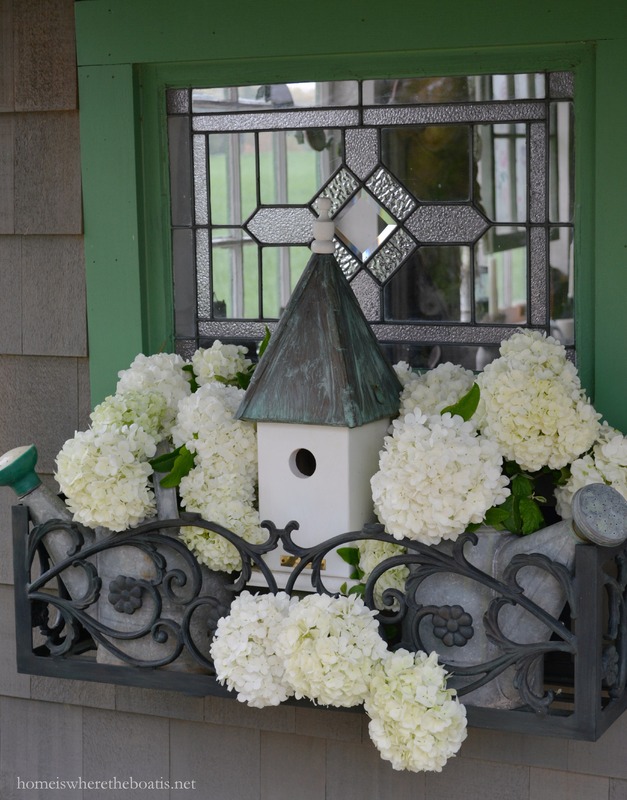 Such beautiful pictures…your bevel glass window picture is stunning! Thank you for your post and the smiles it brings. So beautiful. My elderly neighbor had a Koren spice viburnum bush. The smell every Spring was like a whiff of heaven, with every breeze. Thank you for the reminder! 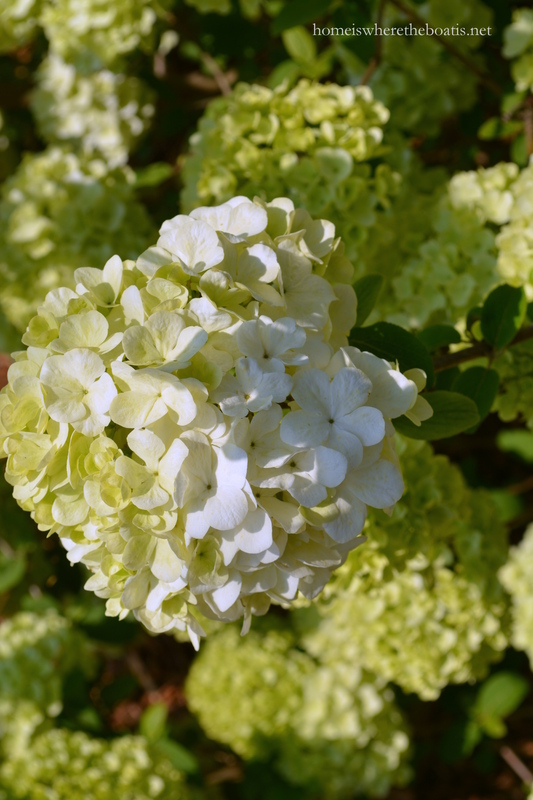 Mary, we planted a snowball bush last fall but I had forgotten which variety that I had. After seeing your photos, I’m sure it’s the Chinese variety. We moved it to a better spot early this spring, and now it’s covered with blossoms. I loved seeing the size of your 3 year old bush and am happy to know that they make a great cut flower. I love the snowball bushes around here and need to plant some so I can enjoy my own. Yours is beautiful. Just beautiful! 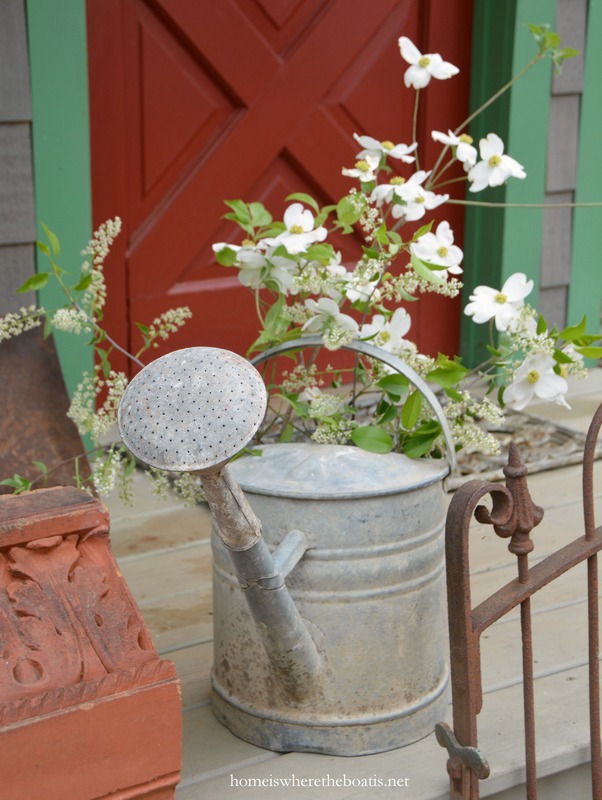 I have Bridal Wreath shrubs; they have little snowballs – love them but I may have to get one of these beauties! We’re in full bloom now with lovely weather. Won’t be long and it will be hot but that’s ok! Pretty! You’re about a month ahead of our growing calendar, Mary. My neighbor has a Chinese viburnum that’s very mature, about 15 yrs old, and it’s always fun to see those snowballs (NOT the other kind!). What pretty, welcoming snowballs for April, Mary! Those are the kind that everyone loves and you’ve displayed them so prettily. 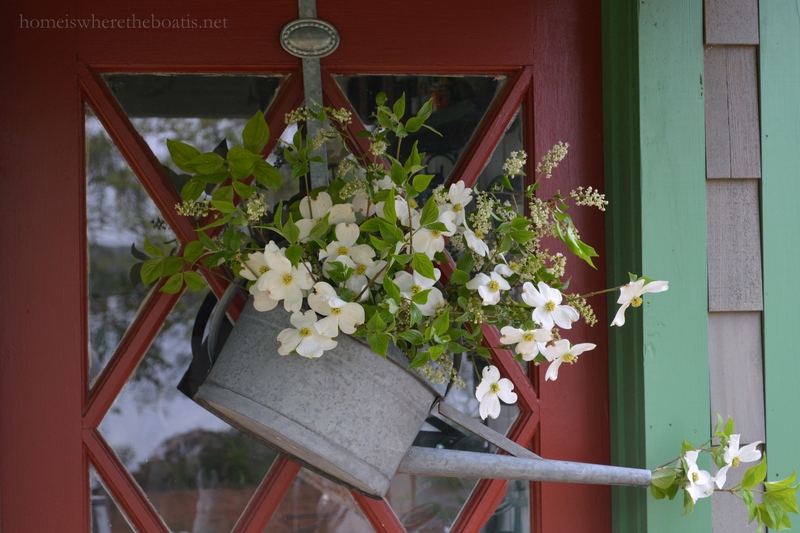 I love your front door watering can filled with branches of dogwood. Enjoy your Spring day! 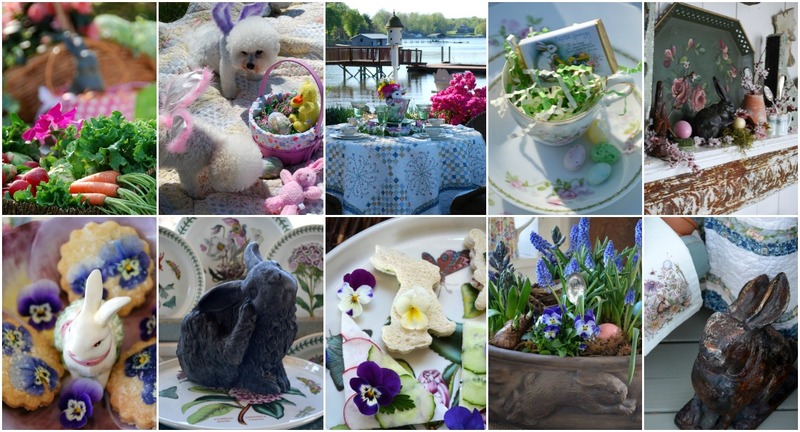 The flowers are beautiful, such a wonderful spring time treat. Snowball bushes are so pretty, and that is the only kind of snowball I need to see for a long time! Thanks for sharing the beauty of your landscape. I’ve never seen a Chinese Snowball bush before. Your arrangement is beautiful. Last year our hydrangea bush never bloomed so hopefully it will this year. Our peony bushes are sprouting up through the soil. I love it when our peony bushes are full of blossoms as they are so fragrant. Beautiful! I’ve never seen them here, so not sure if they will row in our area. you have turned your lakeside into a gardeners paradise! i am so happy you moved to the lake, that we get to reap all the hard work you have put back into the earth! these are my favorite type of posts, the ones that make my cheeks hurt from smiling! 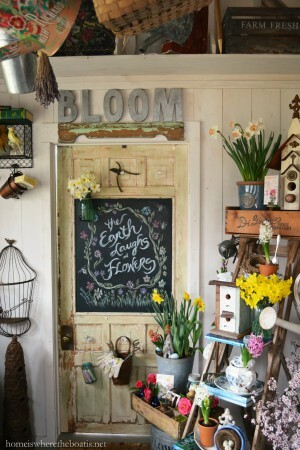 love love love the details, the pics, the feel of the garden! Beautiful, Mary! So close to the look of the hydrangea! We have nary a bloom here on anything! Even the forsthia are very late. Enjoy your gorgeous surroundings! 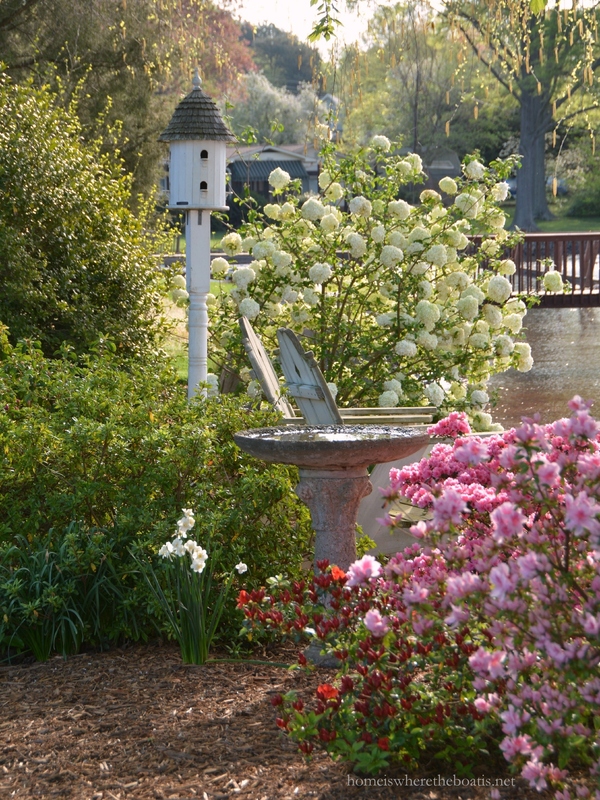 Snowballs, Tulip Trees, and Forsythia….nothing more beautiful than the South in springtime! What beautiful blooms, each and everyone is heavenly!! My grandmother had a huge snowball bush in her yard (well, it looked huge when I was 6 years old). It was so full of blooms, I can still remember it some 62 years later. Oh, WOW those kind of snowballs! What early bloomers, lucky you to now have them to dry! 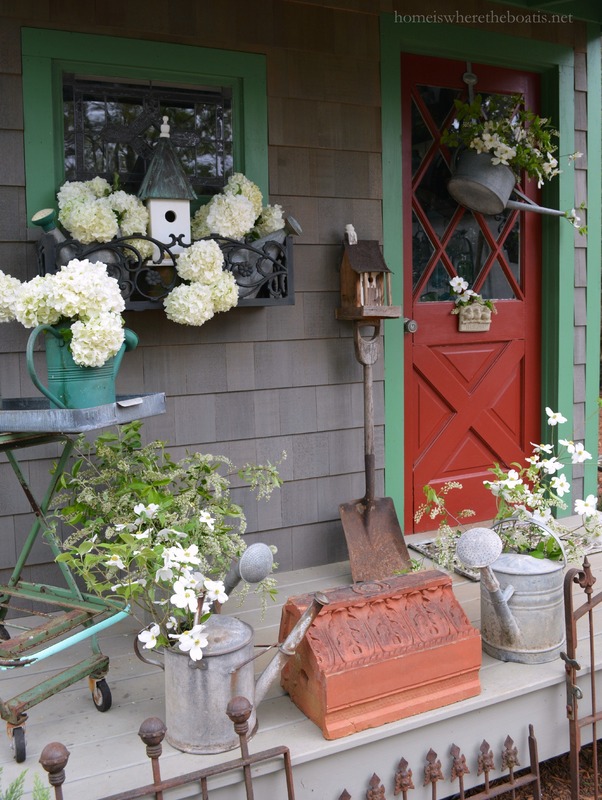 I was just telling my hubby that I need to go to the farmer’s market to get a snowball viburnum….I love these..they are spectacular when in full bloom….love what you did with them and the dogwoods in the wonderful watering cans….I love the iron window box….Been looking iron scrolled window boxes for my house…may I ask where you purchased yours? Mary, If you bury a snowball still attached to your bush, it will root and you will have another bush. We have done that so I know it works. This fills my heart with snowy joy! I miss our snowball bush! It was glorious. I hope the new one we have here will produce SOME blooms! 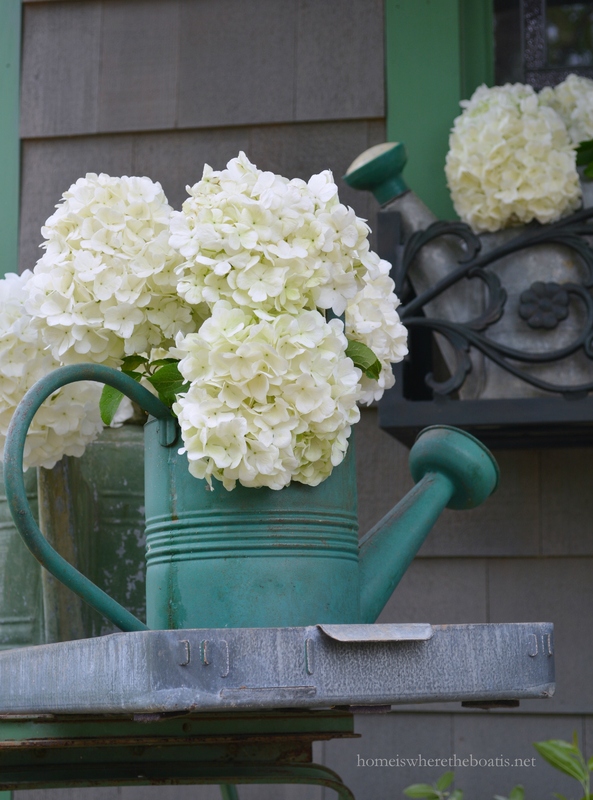 The flowers in the watering cans are fabulous! Oh, Mary…that is a beautiful bush…so much like my favorite hydrangea. I bought what was labeled as a viburnum macrocephalum several years ago…it definitely is a viburnum prunifolium…what a big disappointment! 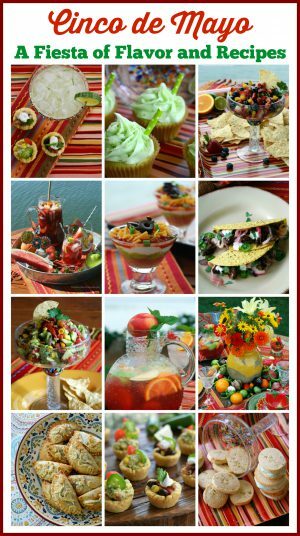 Your photos are the best ever! Wish I had enough sun to grow this plant…..sooooo beautiful. Love the snowballs and your shed is adorable! Thank you for joining HSH! 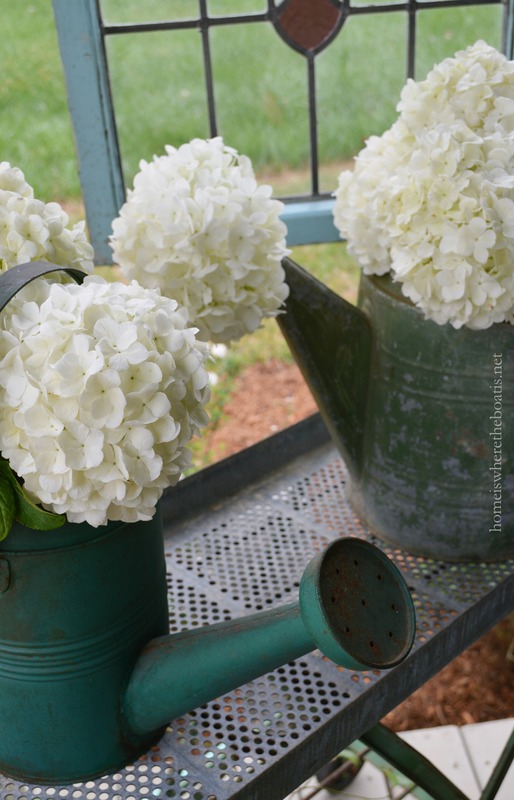 Snowball viburnum is one of my favorites. Our neighbors have several huge trees (they are much larger than bushes!). Always love seeing your precious shed, Mary. Sorry I haven’t been around much, but I homeschooled my daughter this year, and I took a break from blogging.